Because there was no mantel to hang stockings from! Hoping and hoping I had enough cash! Then what to my wondering eyes should appear? But a whole wall of mantels which brought me much cheer! He loaded my mantel and turned with a jerk. He rung up my purchase and I let out a whistle! Made my mouth hang open and I stood there in awe! Antique Oak Mantel Lion Head Golden Oak Era Circa 1890. Carved lion heads, acanthus leaf. 2 Large and 2 small shelves. Beveled mirror. This mantel is super sturdy, clean, and ready for easy installation! Measures: 11″D x 60″W x 81″H. Opening 37″ x 37″. We buy entire estates passing the savings on to you.This is from a very fine, eclectic, non-smoking, estate in the base of the north Georgia Mountains. We have multiple mantles from this very estate. Great Stuff! This antique oak mantel is from the same estate and is from the golden Oak Era. Circa 1890. Beveled mirror, 2 large shelves, 2 small shelves, turned post, and squared columns. What a fabulous Oak Mantle from the Golden Oak era. 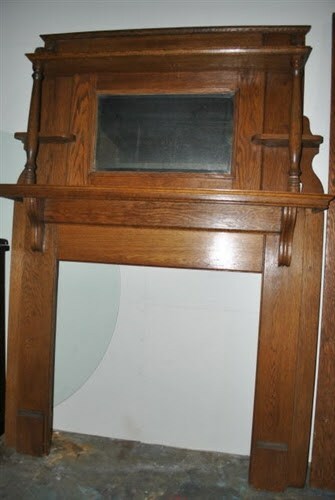 What a fabulous Oak Mantle from the Golden Oak era here in America. 2-Shelves Beveled Mirror. Turned posts, square column supports, carved acanthus leaf. Super sturdy and clean. Ready for easy installation. Circa 1890. The heater insert is not included. Measurements: Overall 10″D x 54″W x 76″H. Opening 42″W x 36″H.